It´s a drivers watch with a genuine NEW MAN3A red dot display. The SASM60 module comes with a modern microcontroller to minimize the power consumption and all watches will be delivered with a working (!) flick of the wrist feature. The watch shows time (12h or 24h display), seconds, date (mm:dd or dd:mm) and a special feature. That can be the day of week, day of year, year or week number. A novelty is the new #HGWC EE-Store: That´s a memory and recall system to change the battery without data loss. The watch has a 2nd time zone and a low battery indicator. The case, back and all links are made from solid stainless steel grade 316L. The button is always 18K solid gold and the gold colour depends on the watch model. All models come with a scratch free sapphire crystal. A nice wooden box completes the package. The watches are tested to be water resistant to 100m / 300ft. Available is the version V101 and V102 with a brushed and mirror polished surface. A black DLC version, a chrome version and watches with leather straps will follow by the end of january. 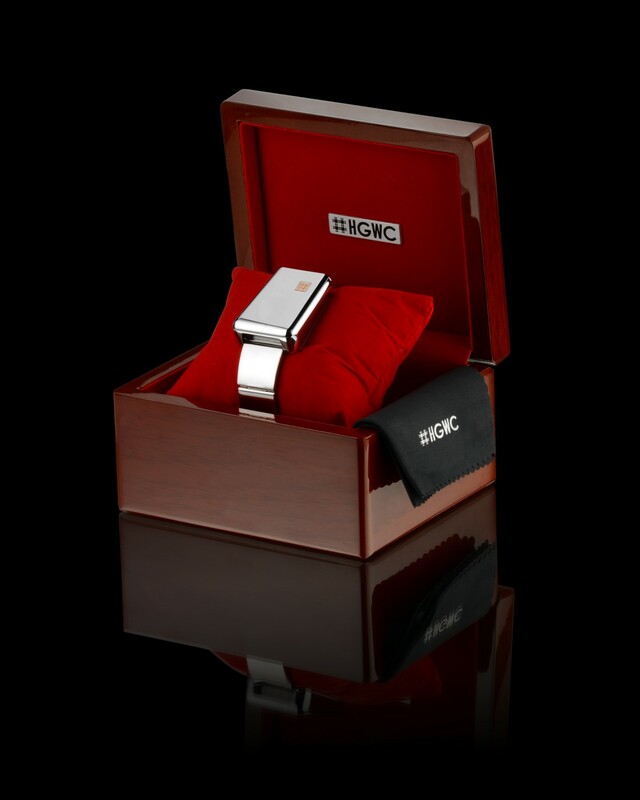 The stainless steel case with serial number, brushed with all the bells and whistles and a red gold button if possible. I find the yellow gold to be too brassy. Is the red gold choice available? I have to get to my home computer as the iPad will not allow a "payment type" to be specified. available serials are 0032, 0037, 0038, 0039 and 0040 at the moment. You can choose from one. I do not plan to sell yellow gold buttons as I don´t like the colour either. Of course I do have a brushed version for sale and this version comes with a 18K red gold button. Shipping is free of charge. Pm sent through DWF and your HGWC site. That's a great looking LED watch! Can't wait to see it, turns out it is a Christmas present and she agreed! Hanno, what does the tic tac to crosshatch logo represent. Is it related to the fact the first computer game created was tic tac to. The watch looks superb, congrats on a job well done Hanno - I am saving up my pennies for one too. Would I be correct in thinking that you also have a green version planned? Is there a manual we can download? @ronaldheld: No, not yet. I will do a major update of the website with the introduction of the black DLC version with a small gallery on the front page and a manual to download. 1) Next weekend I would like to finish the paper manual which will then by shipped with every watch. Yet, my customers get a preliminary pdf version and I have to send the booklet to the customers a bit later. The booklet will be printed next week, I´ve done the english translation already which has to be corrected by charger105 (hopefully!) again. 2) Next week I will get the hard chromium cases back, which will replace the polished V102 version. 3) Today I´ve shipped the first sample watches that get the new DLC coating and I should get them in return by the end of january latest. Then my photographer will do new pictures and the website will be updated again. @bucko170. Thank you very much. I´ve got a few SASM61 greenies with line display running (with a totally different circuit board, microcontroller, components and power cells). The greenies will also come with other software and less functions. Personally I prefer the red display anyway. it's great to see a real quality LED watch in serial production again. I will have to save for a while to buy one and make a video of it! I am intrigued by the green display. All mine are red- like you I prefer red, but a green one would be different and more rare. As mentioned this is a real LED in production form. It is likely the first LED in 10 years after Jeff Lockhart introduced his bigblock Majestyk. Tokyoflash sells LEDs by the dozen but this one is the real deal with vintage dot type digits. Is the display made to the same specs or have you applied some upgrades? Still 2000 miles away, but at least it's on the continent! There will be a jeweller´s manual available in about one week with a complete spare part list and instructions on servicing / battery change. Hanno, what is the weight of the watch including the bracelet? The total weight incl bracelet is 137 g (4.83 oz). You can find more info on the main page of www.hgwc.de. Scroll down to technical information. I did not see that section before. Thanks. We need to see more. If you are interested in such a watch I can send one for free. Just return it if you don´t like it. I have a chrome, brushed or DLC (anthracite) version available.